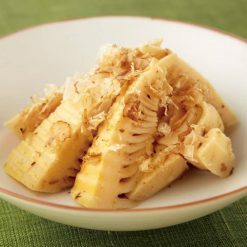 This Tosa-ni dish is lightly seasoned and made using bamboo shoot tips. Product totals 90g (6 to 8 pieces). “Tosa-ni” (or “tosa stew”) is a term used for some foods stewed with katsuobushi (dried and shaved oceanic bonito). 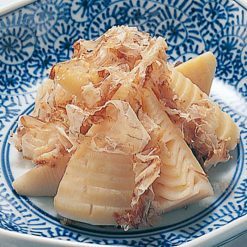 These bamboo shoot tips are cooked in a lightly flavored dashi soup stock made with both katsuo (oceanic bonito) and kombu seaweed, and then garnished with magurobushi (dried and shaved tuna) after cooking. The bamboo shoots used in some dishes are rather crunchy; but because only the pointed tips of the shoots (which are the softest part of the plant) are used in this item, they are quite easy to eat. Many similar commercially available items use chemical seasonings, and some are not cooked with seasonings at all; but only garnished or paired with a sauce after cooking. Without defrosting the bamboo shoots, use scissors to make a cut in the end of the bag for air to escape; then place in the microwave.Approximate cooking times: 2 minutes in a 500W microwave, or 1 minute 30 seconds in a 600W microwave.Because these bamboo shoots come seasoned and take only moments to prepare, they make a great midday snack. Alternatively, their wavy surface also makes for an attractive appetizer or side dish at dinner! 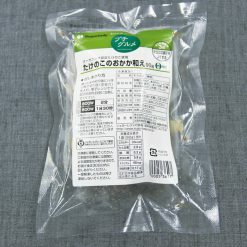 This product contains organic bamboo shoots (China), hon-mirin, soy sauce (contains wheat), magurobushi, sugar, flavor (katsuobushi, kombu seaweed).. Origin of ingredients: bamboo shoots (China). Prepared and packaged in Japan.